Description: Smith And Wesson Model K22 Outdoorsman Double Action Revolver serial #656033, 22 LR, 6” pinned barrel with a bright excellent bore. The metal surfaces on this 5-screw K-Frame retain about 97% original blue finish showing some silvering on the high edges and muzzle as well as some thinning on the ejector rod and grip frame. There are some light spots of surface oxidation scattered on both sides of the frame and the cylinder exhibits a light turn ring. 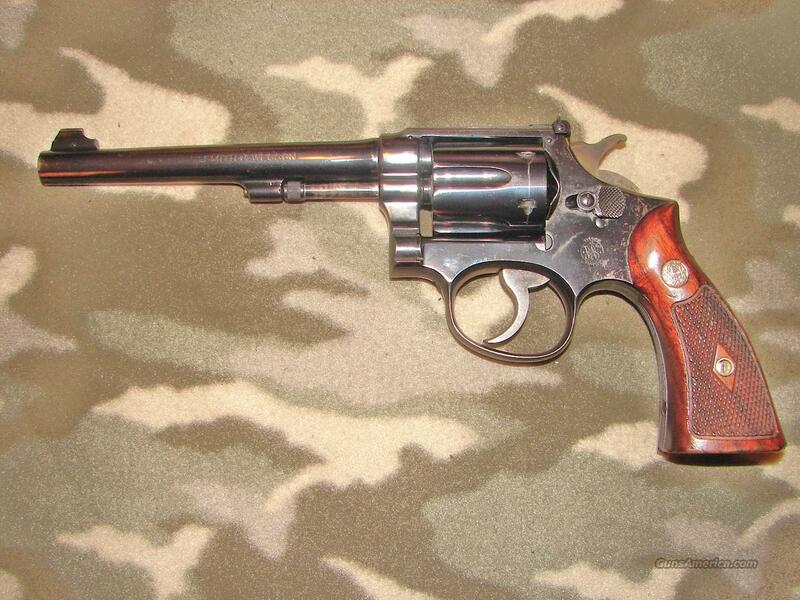 All parts on the gun match numerically with the exception of the diamond checkered walnut grips with silver Smith and Wesson medallions, which rate very good to near excellent displaying a few dings and handling marks. This revolver is outfitted with a color case-hardened magna trigger and standard hammer which still retain about 92-95% of their vibrant color with some light operational marks on the hammer. Featured is a black adjustable rear sight with a Paine front sight. This fine example of a Model K22 Outdoorsman rates excellent overall and would make a great addition to any Smith and Wesson collector’s battery.